High Heels Are Murder by Elaine Viets, a Mysterious Review. 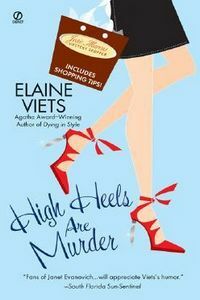 Review: Josie Marcus, mystery shopper, returns in her second madcap adventure, High Heels are Murder by Elaine Viets. While mystery shopping a shoe store to which complaints have been made by woman who say that a certain salesman seems a bit more interested in their feet than in selling them shoes, Josie catches him in a compromising position with a pair of her own shoes. Just a day after being fired from his position, he's found murdered. Josie's neighbor's daughter, "Miss Perfect" Cheryl, to whom she is compared by her mother, is unexpectedly accused of the crime. Soon Josie finds herself drawn into an investigation involving men with "special needs". High Heels are Murder is typical of this genre, reasonably well written and plotted, and will no doubt appeal to those readers who appreciate their murder mysteries liberally sprinkled with references to designer brands (and not to those who don't). Josie is an entertaining character, and there are certainly a few instances where it's hard not to smile at the situation in which she finds herself. While the story is frivolous and light-hearted, Viets tries to instill into Josie characteristics that readers may find familiar in their own lives. Josie's a single mother, struggling to make ends meet, but working in a job she clearly enjoys despite the poor pay. She's constantly trying to live up some standard she attributes to her mother, but is it really her own standard that she's trying to live up to? These are interesting facets for a lead character, but at times they seem out of place in what is primarily a comedic mystery. Acknowledgment: Breakthrough Promotions provided a copy of High Heels Are Murder for this review.